Nekhbet with staff and shen ring. 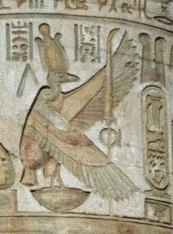 Nekhbet was a goddess in Egyptian mythology who was depicted as a vulture. She was the protector of a city but grew into the protector of upper Egypt, protector of child birth and the protector of the pharaohs. This page was last changed on 15 September 2018, at 01:33.